Chael begins his search for 'random thing he's better than 'Shad at'. 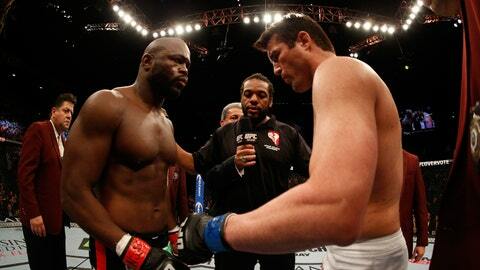 Chael Sonnen might have found two things he can beat Rashad Evans at. Sonnen, who was TKO’d by Evans last month at UFC 167, challenged his UFC on Fox broadcast partner Evans to a staring contest and who-can-hold-their-breath-longer competition Friday night before UFC Fight Night: Hunt vs. Bigfoot. Who won? Unlike Evans’ dominant win in November, that’s open to interpretation.